Home-canned tomatoes are a beautiful sight. Can you believe it? This is post #100 for Eat Simply Eat Well. It’s been so much fun writing this blog. Thanks for your feedback. Thanks for stopping by every now and again to enjoy. I’m looking forward to many more months of sharing recipes that hopefully make you want to get off the couch and get cooking. Of course I say this as I come back from a long break – By now you’re probably wondering where I’ve been and if all I’m going to be talking about from here on out is tomatoes. It’s summer! What can I say: it’s seems like all of nature has been erupting with a bounty of good things to eat, so if I’m not working (or eating), I’m out collecting and preparing the good stuff to save for later. It’s been a great season: cucumbers turned into Dill Pickles and Bread & Butter pickles; Jams: wild raspberry, blackcurrant, bilberry, apple jelly; applesauce; dried apples; chanterelles; fresh caught perch – now fileted and in the freezer; both frozen & dried red bolete mushroom; both frozen & dried boletus edulis = porcini – which have been so abundant this year that I cannot actually pick all the ones I’ve been finding. And then there have been tomatoes. Not from my garden – those failed miserably and were still green at picking time last week, but there are plenty of other great sources, so go get a box because canning them just got easier. Get a big pot of water and set it to boil over the stove. Get your jars washed and sterilized – either boiled in the canning pot, on the rinse cycle in the dishwasher, or in the oven. the second option is that you dump the tomatoes you’ve pulled out of boiling water, put them on a counter top/in a strainer; peel quickly; dump them into a wide, shallow pan, and bring quickly to a boil. You’re nearly as sweaty and grumpy as you would be with option 1. When all the tomatoes are peeled, you pull out your sterilized jars from wherever they are, dump your fresh lids into their own pot of hot water, and begin transferring the tomatoes into the jars, wiping the rims, sealing with the hot lid, and setting them in the canner for a nice long boil (35 minutes for pints/0.5 liter and 45 minutes for quarts/1 liter). Whew. Feels like a big, hot, sweaty, drippy, messy project. And it doesn’t take a lot of review of the above five steps to realize that the combined effort of steps 3 & 4 are enough to make many people turn away from the stove top, grab a cookie, and head back to the couch. What if I were to tell you that you can mostly skip those steps all together, still dispense of the annoying tomato peel AND eliminate the problem of tomato float? Yes, Yes! some of you are thinking. Wait – what’s tomato float? Some of you may be wondering. It’s a harmless, but cosmetic side effect that comes when an enzyme in the tomatoes that causes the pulp to separate from the juice isn’t killed quickly enough. Heat kills it – but what happens normally is that the tomatoes are boiled so the outside of the tomato is cooked in order to get the peel off, but the inside is raw. They are then shoved into jars this way, sealed, and then into the hot water canning bath where the heat rises, but not quickly to eliminate the effect of the enzyme. You’ll know you have tomato float when you have a mass of tomatoes pushing up toward the top of the jar above a quantity of clearish liquid. It’s safe to use, it’s just not pretty. I discovered this trick by chance, and only because I happened to make roasted salsa just before I was planning on canning tomatoes. My goal wasn’t to get rid of the skin – just to char it. So I heated the oven as hot as it would go on the broil setting. I halved as many tomatoes as would fit and laid them face-down on a parchment lined pan, placed the pan 4″/10 cm from the top of the oven, and set the timer for ten minutes. The skins weren’t quite broiled at this point (for the salsa I let them go a little longer) but what did happen is that the skins puckered and split a bit, and when I tested one, pulled very easily away from the tomato. Get your canning jars ready & sterilized. My favorite is to use the shortest cycle on the dishwasher with no detergent (assuming your jars are clean and only need sterilization; otherwise wash them). But whatever method you are comfortable with is fine. Rinse about 5 lbs of tomatoes. Slice them in half. Lay them cut side down on the baking tray. Get happy with it: you can pack them in nice and tight. Place the tray in the oven for 10 minutes. Meanwhile, get a small pot of water heating for the lids. Place a large frying pan or other wide, shallow pan and place it on the stove. Get your funnel handy. Set a pair of tongs and a fork nearby. This is going to be easy. When ten minutes is up, pull the pan out of the oven, place in on a heat-proof surface. Using a fork and a pair of tongs, grab the skin of each tomato at the top with the tongs, hold the tomato in place with the fork, and pull the skin back toward the stem end and off. Discard the skin. Repeat with the remaining tomatoes. Peel tomatoes using a tongs and a fork. Crush the tomatoes with a fork or a potato masher. Pour all of the tomatoes into the wide, shallow pan. Bring to a boil over high heat; reduce to medium-high, and boil for 5 minutes to kill the enzymes I talked about earlier. At this point, turn off the heat underneath the pot you’ll use for lids. Add the lids and let them heat up. Boil crushed tomatoes for five minutes. Place your jars on the counter top. Add 1 tablespoon of bottled lemon juice to each pint/0.5 liter and 2 tablespoons of bottled lemon juice to each quart/1 liter. Note: DO NOT use fresh lemon juice. It’s not acidic enough and your tomatoes will not be shelf-stable. 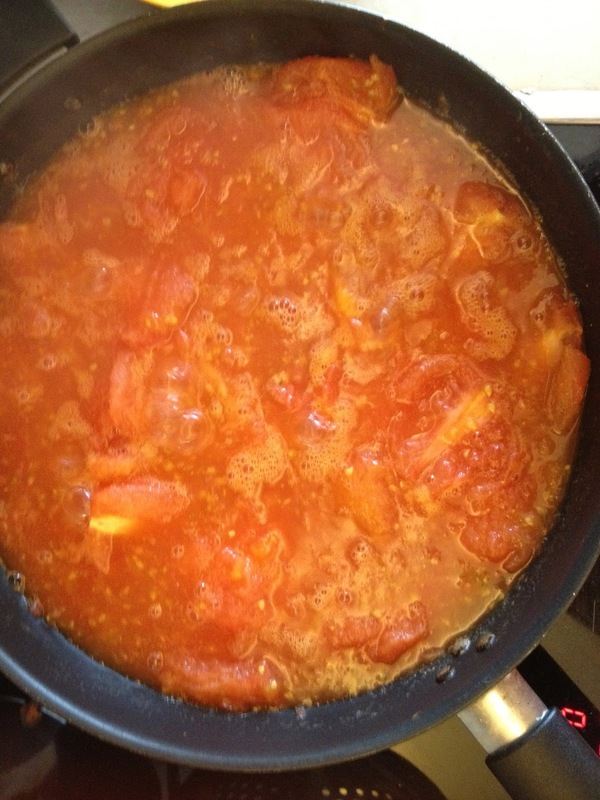 Ladle in the tomatoes to fill each jar, leaving 1/2″/1.25 cm of space (head room) at the top of each jar. Wipe the rim with a clean, damp towel. Place the lid on top (or lid and ring if you are using the two part lid system – they don’t have these in Finland) and seal until it’s finger tight. One way to make sure you don’t over-tighten is to stick your pinky finger out while you tighten the lid – try it! It works. You’ll get it just right. Place the jars in a canning pot or tall stock pot. If you have a canning rack, place the jars on the rack. If you don’t, place a folded dish towel at the bottom of the pot to prevent direct contact between the heat source and the glass jar. Cover the jars with 1/2″/1.25 cm of water. Bring to a boil. Once boiling start timing the processing time: 35 minutes for a pint/0.5 liter; 45 minutes for a quart/liter). When the processing time is up, turn off the heat and let the jars rest for 5 minutes. Remove the jars from the pot and set onto a thick dishtowel on the countertop. Allow them to cool, undisturbed, until they are room temperature. The tomatoes will be shelf-stable and good to use for at least one year. Sounds easy, right? It is. And you’ll love having your own tomatoes to use up all winter. What are you waiting for? Peak season for tomatoes is now. Oh – and that tomato float issue? Solved. Nothing but pure crushed tomatoes, top to bottom. Enjoy! Do you have to mash them? Or could you just can them halved with boiling water added to the jar? Hi Anonymous – no, you don’t have to mash them – I just like using them mashed. If you want to add the halves straight to the jar, but you’ll still want to boil them briefly to make sure the enzymes are deactivated. I wouldn’t add boiling water as the tomatoes have a lot of juice – enough to cover themselves in the jar, and the water would dilute the flavor. I hope this helps! This is a great, tried and true way to peel tomatoes! I learned this trick last year and it is awesome! One thing though… my broiler isn’t working right now (roasting is fine too, but I love the charring flavor), so next time around I may try putting them on the grill in a lined veggie basket. We’ll see! Thanks for sharing! Hi Kate, I would love to know how they’d work on the grill! I’d imagine it’d work great – with a little smoky flavor for an interesting dimension. Let me know how it goes! Thankyouthankyouthankyou! SO going to do this – I canned a bunch of salsa last spring and I was SO sick of peeling tomatoes. Cannot wait to try your method.